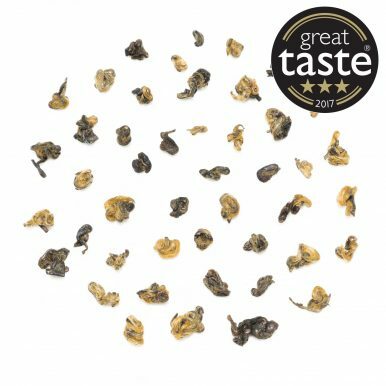 Dian Hong Jin Luo Golden Snail from Yunnan Province of China is produced by rolling tea buds into small golden coils, or snail shapes. The dark amber liquor has a savoury scent of rye and soy. The taste is sweet and malty, like a sweet bread, with notes of cocoa and molasses. 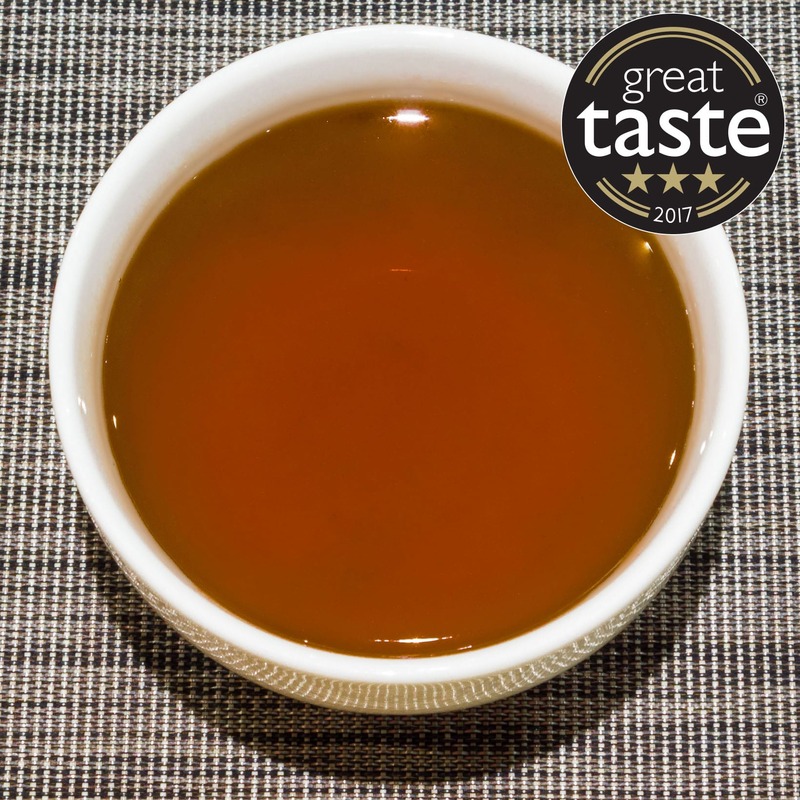 Dian Hong Jin Luo Golden Snail black tea from China, winner of a 3-Star Great Taste Award in 2017. Dian Hong Jin Luo Golden Snail (滇红金螺) is an excellent medium strength and balanced black tea that comes form Ning’er County in Yunnan Province of China. Dian Hong, literally Yunnan Red, refers to the origin and type of tea (red according to Chinese tea classification). Jin Luo (金螺), literally Golden Snail, refers to the style of this tea and the way it is shaped into small coils, similarly to the famous Bi Luo Chun (Green Snail Spring) green tea. 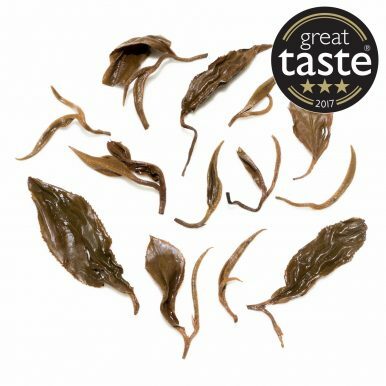 We also offer an exquisite ‘pure-bud’ version, a supreme Dian Hong Jin Luo Golden Snail King. 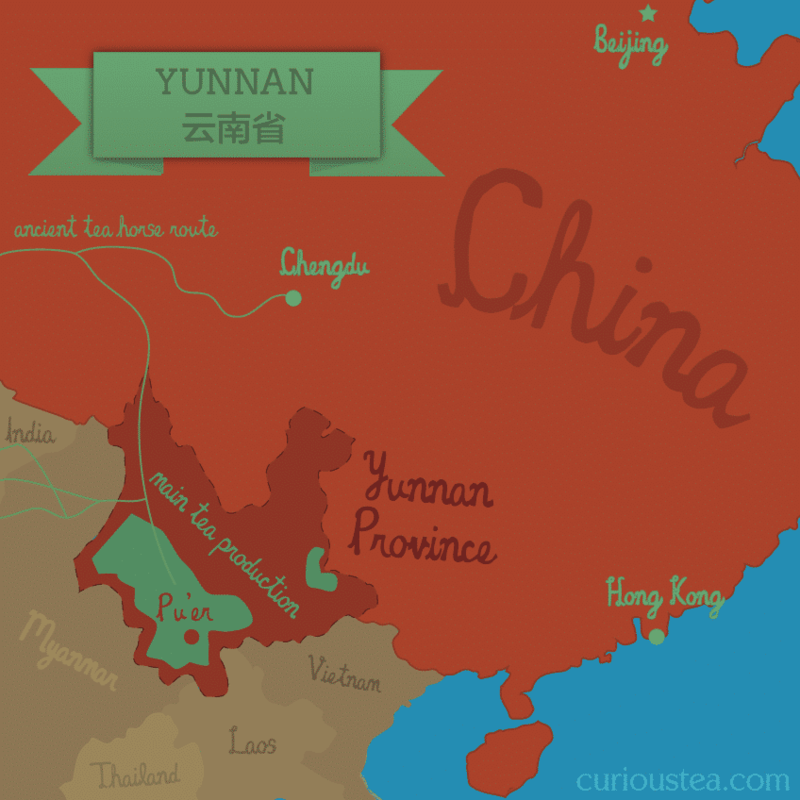 Ning’er Hani and Yi Autonomous County is located in Pu’er Prefecture and next to city of Pu’er in Yunnan Province. Ning’er Country has a large population of Hani and Yi native people, who also inhabit areas in Vietnam, Laos and Thailand. While tea making traditions go back hundreds of years (it is estimated that tea cultivation started 2,000-2,200 years ago in this area and tea use predates that period), black tea production is a relatively new phenomenon in this part of China. The first black teas were produced in Feng Qing County around 1938. 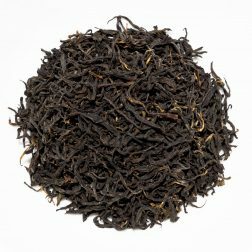 These proved quite popular so the production of black tea quickly spread throughout Yunnan Province. 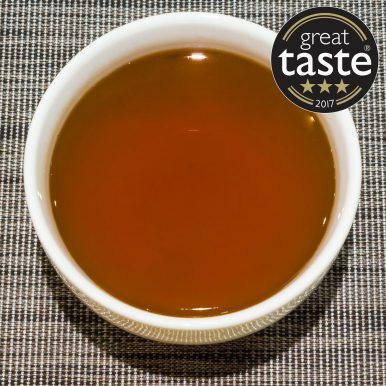 The rise in popularity was largely attributed to the balanced and smooth flavours of Yunnan Red – fully bodied sweet maltiness without any of the astringency of many other black teas. 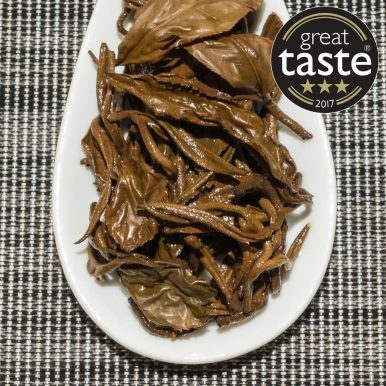 Dian Hong Jin Luo Golden Snail is processed from hand plucked one leaf and one bud leaves of the Yunnan Large Leaf cultivar that is also used to make the numerous pu-erhs of the region. The leaves are hand rolled during the production process into small coils or snails and you can see plenty of these golden coils in the finished product. Like other Dian Hong teas, this Jin Luo Golden Snail can benefit from short term storage and maturation to further develop the flavours. Or you can enjoy it straight away! The tea was plucked and processed in spring 2018. 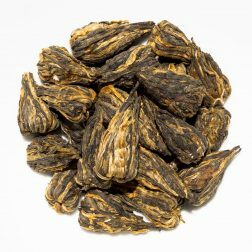 The dry leaves are shaped into small coils, or snails, and have plenty of bright gold and black colours. 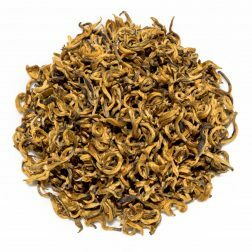 When brewed, these coils will unfurl, revealing the one bud and one leaf structure. The umber liquor produces a medium strength liquor with a somewhat savoury light scent reminiscent of rye bread and soy. 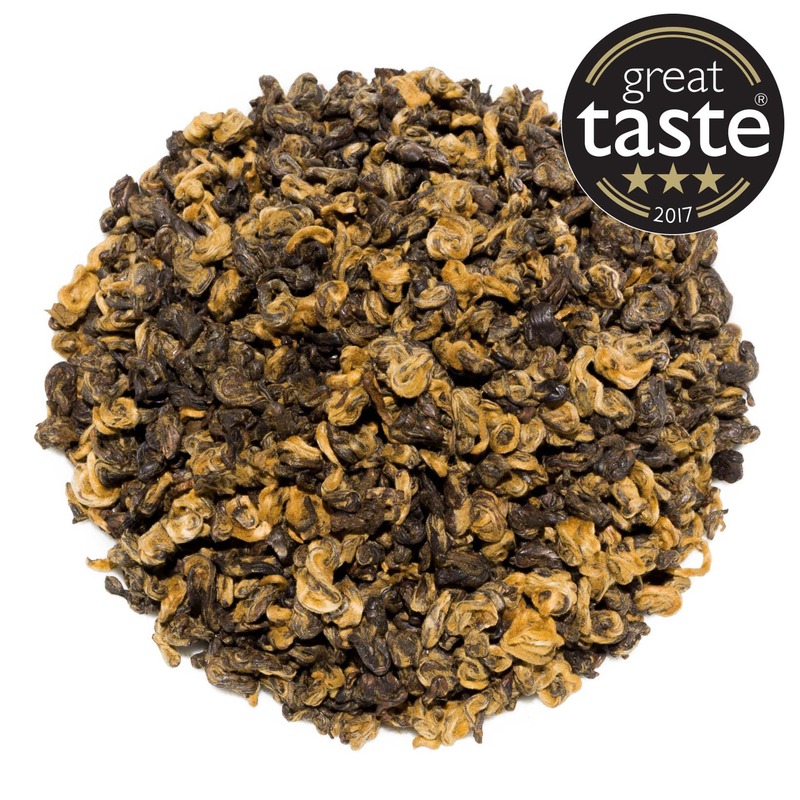 The flavour of this Dian Hong Jin Luo Golden Snail black tea is sweet and malty, very much like a freshly baked sweet bread, with notes of cocoa and molasses. 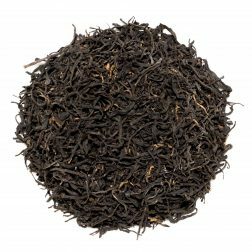 A perfect black tea to have without milk as it’s very smooth and does not have any astringency. Of course, it can always be brewed stronger by steeping the leaves for 5+ minutes to make a particularly strong tea that could take a dash of milk if you are so inclined. 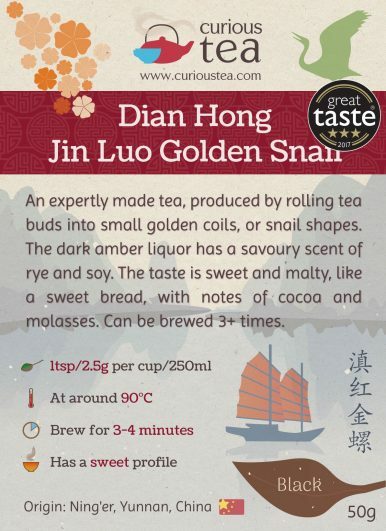 Dian Hong Jin Luo Golden Snail black tea is best brewed at 90°C for 3-4 minutes according to your taste. It can also stand multiple infusions well. 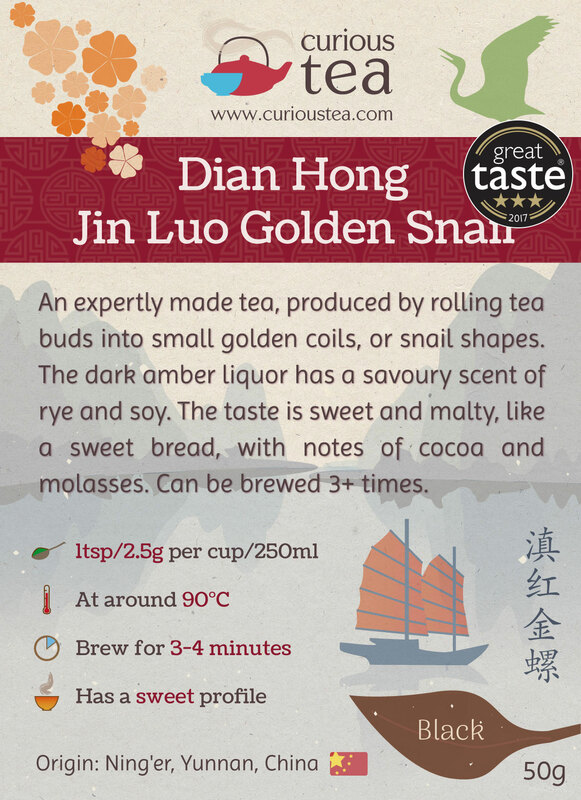 This Dian Hong Jin Luo Golden Snail black tea was first featured in our August 2016 Curious Tea Subscription Boxes.